The industrialization of the Soviet Union was fast and ruthless. In pre-revolutionary Russia, 80 percent of the population was peasants, most of them illiterate. Within a very short period of time, an economically backward agrarian country became a largely self-sufficient and powerful industrial empire. Five-Year Plans, which set ambitious economic development goals to be completed in a fixed span of time, became the organizing force for the Soviet Union. However, by 1935, 40 new power stations were constructed instead of the initially planned 35. The Volkhov Hydropower station was the most powerful in Europe, with eight turbines. 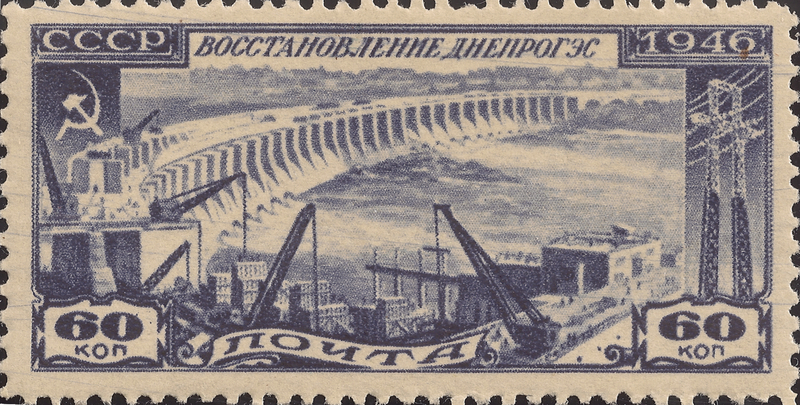 The Dnieper power plant became a symbol of Soviet progress in technology. During the first Five-Year Plan of 1928-1932, the average growth of industrial capital reached almost 300 percent. This drive towards industrialization was reflected in postage stamps of the period. Many stamps bore images of industrial projects, frequently inscribed with diagrams and minute details such as the kilowatts to be generated by the new power plant.